With your contributions, we can tackle a number of important projects that will improve safety in the theater, increasing learning potential to bridging technology gaps, and make the performances more professional. Students who are exposed to the latest technology at the high school level enter college with an enormous advantage, whether they are planning to enter the field of Performing Arts or some other career. Please keep these projects in mind as your consider donating to P.A.P.A.S, Inc. Yes, I want to keep the Performing Arts alive and well at BMHS! If you have a PayPal account you can make a payment now. Just click the Donate button and follow the instructions. You can also create a PayPal account by clicking the Donate button, it's free! 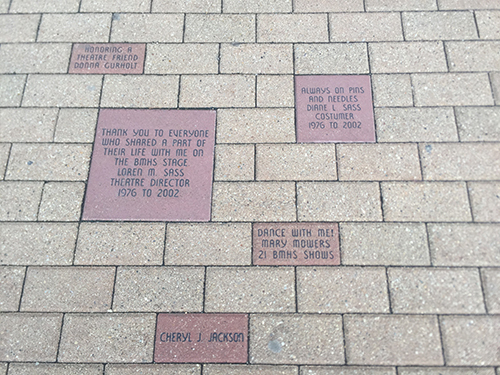 Create your own personal message to be inscribed on one of only 350 commemorative bricks that will be installed in front of the BMHS Theater. Three brick sizes are available. And… we can make a duplicate brick for you to keep or to give as a gift for that special someone! 4. Mail in a check.